28 January 2014. 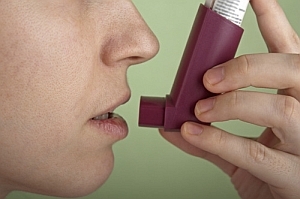 An analysis of genomes of people having both asthma and hay fever, compared to those with neither disease, highlighted 11 genetic variations associated with the dual-disease condition, including two previously unconnected regions. The findings from QIMR Berghofer Medical Research Institute in Australia, with colleagues from Australia, the U.K., and U.S., including the genetics company 23andMe, are published online in the Journal of Allergy and Clinical Immunology (paid subscription required). Hay fever, in its allergic form, can be a contributor to asthma, a chronic allergy-related disease causing inflammation of the airways, and subsequent breathing problems. Australia has an ongoing population study of asthma and respiratory disorders — the Tasmanian Longitudinal Health Study — that in previous studies showed a stronger genetic association between the two conditions, than in people with asthma alone. In the new study, researchers analyzed the genomes of nearly 6,700 people with both asthma and hay fever, as diagnosed by physicians, and more than 14,000 people with neither condition. The company 23andMe says it contributed data from 15,072 of its customers, who responded to surveys about their health conditions including asthma symptoms. Data from three other studies in Australia and the U.K. were also analyzed. The analysis highlighted 11 genetic variations in the genomes associated with both conditions. Nine of the 11 variations were already associated with various allergies, but for the first time were linked to the combination of hay fever and asthma. The analysis also found two other variations — ZBTB10 and CLEC16A — that were not in regions of the genome previously associated with allergies. “In this first-of-its-kind study,” says 23andMe statistician and co-author David Hinds in a company statement, “we’ve identified new genetic associations that can provide the means to identify people at risk for allergic disease with greater efficiency.” Hinds also contributed to a study published in July 2013 of genetic associations of asthma and allergies in the U.K. The company 23andMe performs personal DNA analyses for ancestry and inherited traits from saliva samples sent in by customers. In November 2013, the U.S. Food and Drug Administration ordered 23andMe to stop providing its personal medical diagnostics services, which the agency said did not receive proper marketing clearances.